Tesla is experiencing a pinnacle moment where technologies are defining the brand. But what will happen to the Tesla brand once many of those advanced technologies become universal? Recent history already offers a chronological blueprint for what will likely become Tesla’s next chapter. Twenty-five years ago a small army of automotive journalists descended onto a new model that would change the course of automotive history forever. It was a rolling masterpiece. The leather interior was a match for cars that cost nearly twice as much. The noise levels were far better than the overwhelming majority of luxury cars that didn’t have the advantages of triple-sealed windows or incredibly expensive stamping dyes that could make steel round and thick instead of thin and flat. The technology behind this car cost billions, but it would become the most consistently profitable car of the next 25 years. “With a car like this, who needs a Jaguar?”- I think Brock Yates may have said that. But with the passage of time and the Internet not cooperating with me, let’s just say that the first drivers of this vehicle were completely blown away. Nothing else was close back in the early-90s. I bought one, and nearly 25 years later it’s still on the road with over 350,000 miles. You think I’m talking about a Lexus LS400? That was where many of the advancements took root. But it wasn’t until three years later when the true breakthrough came to the American automotive market. This Toyota Camry, which was as advanced then as it is homely now, changed the course of what we now see as a quality automobile for the masses. Toyota didn’t just sell millions of Camrys and eventually take the best selling car crown from the Ford Taurus and Honda Accord. They sold tens of millions of cars and SUVs that were initially based on the engineering achievements and quality standards of a single model that could initially be bought for less than $15,000 when it was first released in 1992. That first shot into the mainstream car market became Toyota’s moonshot. Every car and SUV Toyota sold that was based on the Camry chassis became a marketplace leader by the late-1990s. The Avalon. The Lexus ES300. The Lexus RX300. Profits were minimal in the early going, but they rose with Toyota’s market share as the decade went forward, and as competitors from Mercedes and Volvo on the high end, to GM and Ford in the meat of the market, couldn’t easily tackle Toyota’s talents. You wanted long-term quality? Toyota became the answer. Today you want an electric vehicle? Tesla has become the answer. 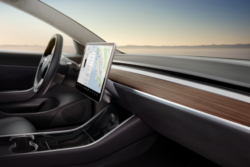 As the then $35,000 Lexus LS400 helped launch the $15,000 Toyota Camry into the heart of the mainstream market, the $60,000 Tesla Model S is launching the technology that’s now become the main selling features of the $35,000 Tesla Model 3. The waiting list for the Model 3 is now over 400,000 and growing. While the Camry needed five model years to become America’s best selling car, Tesla will likely achieve this crown of popularity in only two. Appealing ideas can only become realities in the auto industry when the manufacturer has the mindset and commitment to make them a reality for the rest of us. The Toyota Camry could out-diesel a diesel then when it came to longevity in the 1990s, and today a loaded Tesla Model 3 can go further with electricity than any competitor; while also offering a design that’s far more attractive and safer than the competition. It may not be until 2020 when Tesla has a serious competitor in terms of technology and sales numbers. But between now and then, who do you think has the best chance of making an electric vehicle a popular vehicle?